Highlight for this bike: 1. heat insulation foam wrapped on crank to prevent users from scald. 2. Big rubber anti-slip feet to prevent bike from sliding while using. 3. extra-length and adjustable strap can fit different size of feet. 4. A piece of 40*60cm latex anti-slip mat come with bike, it will be more stable while pedaling on the mat . We are committed to providing the perfect mini exercise bike to our customers, We have been engaged in this industry for 10 years. We know what kind of products are better and meet the needs of consumers perfectly. In response to customer feedback issues, we are constantly improving this product. At present, the most frequent customer feedback is the sliding of the product during use. For this problem, we provide a non-slip mat so that the product will not slide easily during use. Another problem is that the crank will become hot after long time use, To solve this problem, we put a foam on the surface of the crank. Mini exercise bike is designed for knee and shoulder recovery exercise or leg and arm light cycling exercise , increase circulation, improve stamina and relieve tension after long time sitting or working. 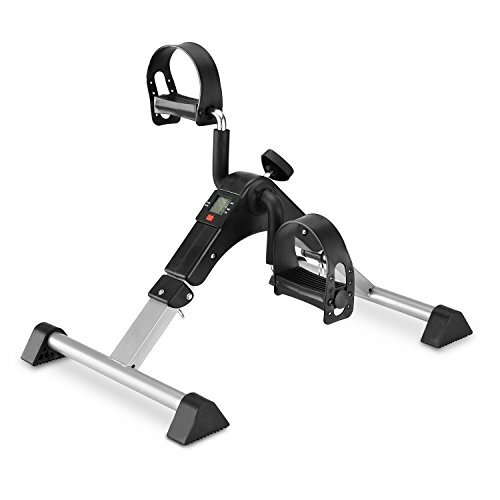 Pedal motion is smooth and quiet, and the resistance can be adjusted a little, perfect equipment for light exercise, the pedaling is very easy and light for the seniors. 5 functional LCD monitor displays exercise TIME, COUNT, RPM , CALORES BURNED AND SCAN, very easily to arrange your exercise. Compact and foldable design is convenient for carry and store, very easy to fold and un-fold, and easily fitting under a desk or similar space . The peddler is made of reinforced steel pipes and ABS plastic, and the crank is wrapped in heat-insulating foam, it is safe and stable to use, and firm enough for long term use. If you have any questions about this product by MOMODA, contact us by completing and submitting the form below. If you are looking for a specif part number, please include it with your message.